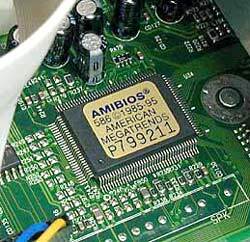 Microprocessor is a basic building block of Modern Computers. It is just like an artificial brain of a computer. It is a controlling unit or central processing unit of a personal computer. It is made by fabricating little electronic components like transistor on a small chip. It is capable of performing different-different operations like arithmetical operations or logical operations. It can communicate with the connected devices. Actually, it can be used only by connecting it to different-different other I/O devices and memory. Then it forms a Personal Computer that you are using. At this time , your computer's micro-processor is having billion transistors in it and executing millions of programs. So, in simple words, the microprocessor is just a simple digital chip, made of many transistors, which is able to send and receive information. Microprocessor receives information through input devices, then process it according to the program written in its Memory(Primary Memory , for example RAM,ROM etc) and then send results on the output devices like Monitor, Printer etc. Microprocessor was invented around in 1971. Intel made the first Home Computer with Microprocessor 8080, which was an 8-bit microprocessor made in 1974. Then the PC market moved from 8088 to 80286 to 80386 to Pentium family. Microprocessors are very efficient, they are very small in size and can be programmed to drive any big machine. The LSI or VLSI technology made it possible to integrate such efficient circuit on a little micro chip. Now we can integrate the whole CPU on these chips, the live example of this are Laptops, Notebooks, Tablets etc. The Microprocessor works as we command it. It'll do what we said him. It executes the programs written in its memory and work according to them. These program are written in some assembly language. The assembly language is nearly related to English. The Microprocessor can only understand Machine language. But its too hard to learn machine language as it is in 1 and 0 and also it is very difficult to find an error in the program, therefore we make use of assembly language and use an assembler which makes our program understandable by Microprocessor. When working, Microprocessor do the following things, this cycle is also known as machine cycle.